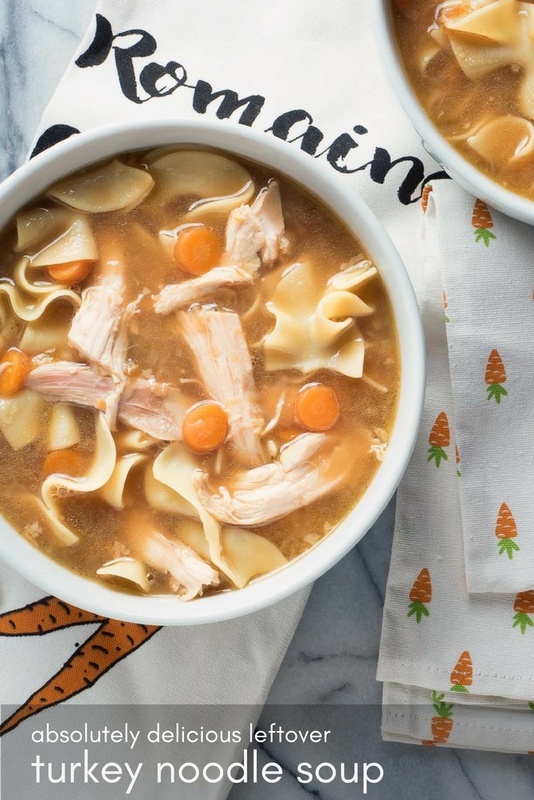 Turkey noodle soup from scratch is about the best thing you can do with your leftover turkey. Deep turkey flavour, tender noodles and incredible mouthfeel make this version special. 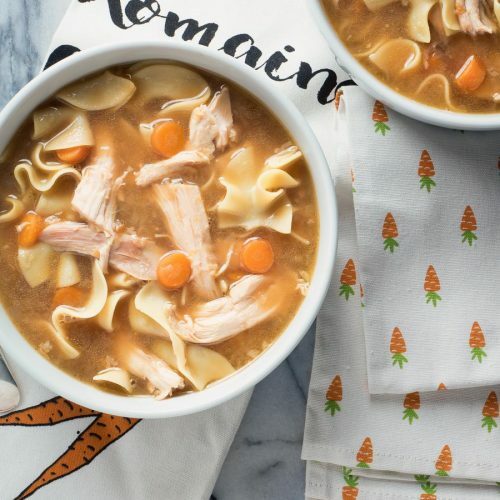 There is something wonderful about turkey noodle soup. Childhood comfort food. Feel good food. Magical almost. Puts a smile on your face. And you cannot beat homemade. No way around it. There’s no single killer recipe. No rock your world – this is the best thing ever. I’ve looked. It’s all pretty much the same. Variations on a theme. I have my own variation on the theme. Mine is about mouthfeel. The difference between a watery broth and unctuous, oh my god this is amazing broth. That small tweak is what makes this version a great one. 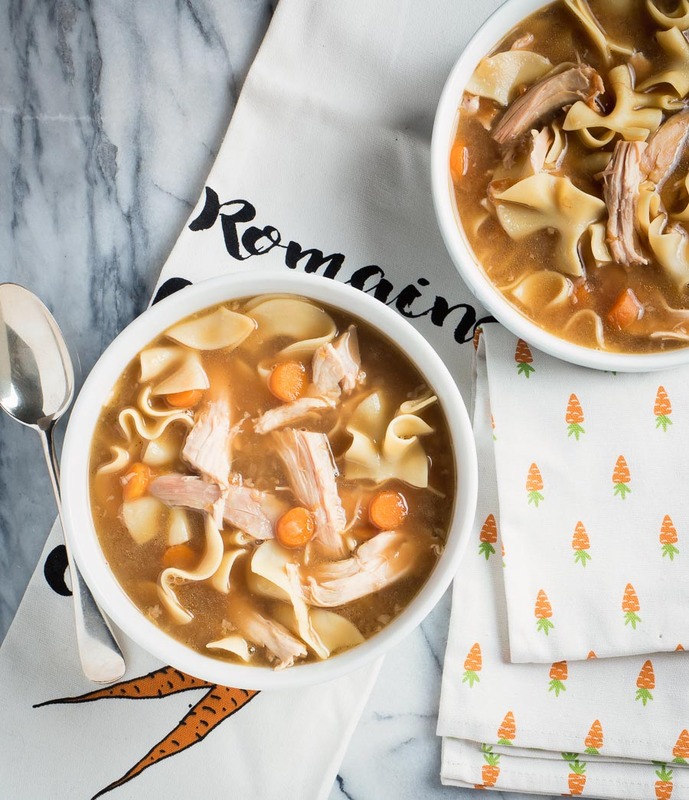 It’s not hard to make really good turkey noodle soup either. Takes a bit of time to make the stock. Simmer the soup. But it’s all unattended. Almost set and forget. This recipe is a guideline. There’s lots of room to improvise. Don’t have leeks? No big deal. Try onion. Want to add peas? OK, that works. Celery? A bit of an overpowering flavour in my mind but why not? There are only three things I think are important in this recipe. Turkey stock, dried thyme and cornstarch. Yes, cornstarch. It’s all about incredible mouthfeel. Turkey stock is a given I think. Noodle soup made with chicken stock is called chicken noodle soup. Add turkey and I call it chicken noodle soup with turkey. Turkey stock is the backbone. Dried thyme is a big one for me as well. Don’t really understand why I do but I do. I don’t use a lot of dried herbs but it works here. The cornstarch is the real secret though. Absolute game changer. When I was a kid I had turkey noodle soup at a friend’s house. I only had it once but it stuck with me as the gold standard. I didn’t cook back then so it didn’t occur to me to ask what the deal was. Fast forward a couple decades. For years I tried to recreate the mouthfeel. Couldn’t figure it out. It took a Chinese friend to put me on the right path. Now I make turkey noodle soup to be proud of. Try it. It’s worth the leap of faith. You’ll never look back. It just works. 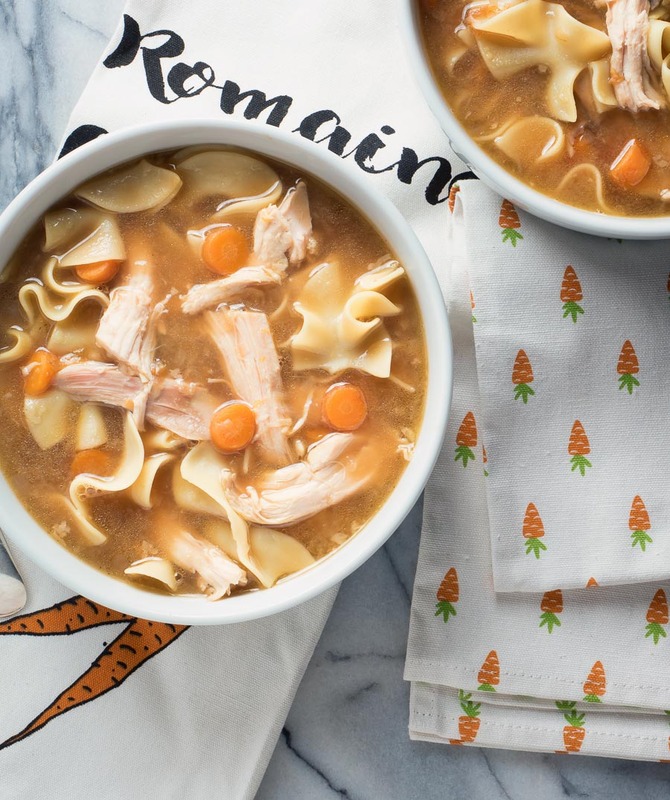 A good turkey noodle soup is the ultimate comfort food. It's the best way to use up the end of turkey leftovers. In a pot large enough to hold your turkey carcass, combine the turkey, onion and enough water to cover. Simmer for 6-8 hours. You want the turkey tasting like nothing and the stock to be flavourful. Heat a pot big enough to hold everything (6 quart dutch oven works) over medium low heat. Add the oil and then the leeks, onions and carrots. Cook, stirring occasionally, until onion and leek are soft but not brown. You won't get the carrots soft at this stage - don't bother trying. This takes about 7-10 minutes. If you don't want bits of thyme floating in the broth, place it in a bit of cheesecloth. Tie securely with food safe string. Add the garlic and the 2 tsp salt and cook another 2 minutes. Add the thyme with the garlic and salt if adding it loose. If you are wrapping it in cheese cloth add it with the broth. Pour in the stock. Let simmer, covered for about an hour. Add the diced turkey and let simmer another 10 minutes. Add the egg noodles and cook until the egg noodles are tender, another 10 minutes or so. Remove about a half cup of liquid and stir in 1 Tbsp cornstarch until thoroughly combined. Return the cornstarch slurry back to the soup. Bring to a boil. The soup will thicken noticeably. At this point the soup is under salted. Add salt gradually until you are happy with the salt balance. Soup takes a lot of salt. In american, appetizer, poultry, soup. Bookmark the permalink. Wonderful recipe! I love making turkey noodle soup after Thanksgiving and also make my own stock. Will try your recipe next time! Pinning, thanks for sharing! Can’t go wrong if you make your own stock. Look delish! I like the use of cornstarch to give the broth that wonderful texture; I use it when making egg drop soup as well. It took me forever to figure that out. Sometimes the littlest things make a huge difference. Yum! This looks delicious! Perfect for the upcoming chilly months, thanks for sharing! Romain, lovely soup! For me, turkey soup must start with the turkey carcass for real turkey broth — no chicken broth! Sometimes I like a thin broth, but this bit of texture makes it more of a meal, instead of “just soup.” And I like your gradual addition of salt. This soup is definitely a meal in a bowl. Corn starch! Who knew? Great tip! I will try this next time I have a turkey around! This looks delicious! So hearty and perfect for the cold winter months. Love it!